No matter who shows up, plays, or otherwise acts civil towards one another! If we still have no idea how many members of Guns N’ Roses will be showing up, performing, or generally making peace for a few hours, now we at least know who’s inducting them at the Rock and Roll Hall of Fame ceremony! Rolling Stone reports that the lucky devils (and/or short-straw-drawers) will be Green Day. The band joins Chuck D, Bette Midler and the gang as induction speakers at the April 14 event. 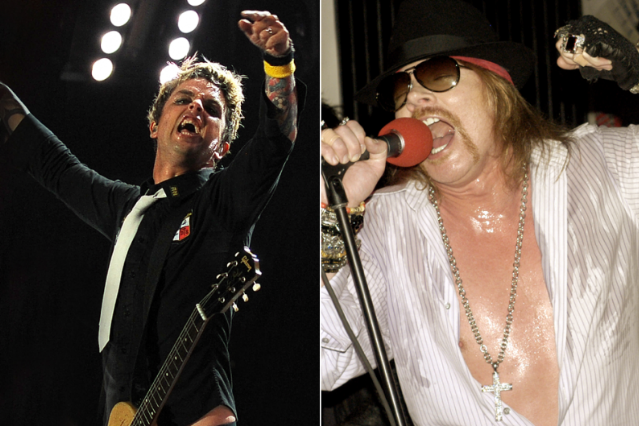 Billie Joe Armstrong knows the drill — he inducted the Stooges in 2010. All original members of Guns N’ Roses except for Axl Rose and Izzy Stradlin have confirmed they will definitely be at the ceremony, which will be broadcast on HBO May 5 (and for non-HBO subscribers, we’re sure, via YouTube clips May 6). Since John Frusciante won’t be attending with the Chili Peppers, GN’R are pretty much the only act among the handful being inducted that’ll have a complicated history seated in the room with them. At any rate, it’ll be a great look for Billie Joe and the gang, who have been busily messing with their fans’ heads via cruelly vague YouTube clips ever since they started recording their new album. Inductors traditionally perform with their inductees, so if Guns N’ Roses can get it together and take the stage, we could get one punky performance of “Paradise City” out of this. Meanwhile, onetime GN’R drummer Matt Sorum is still trying to keep the dream alive that at least he and Slash might still be performing at the ceremony, but as the latter told Rolling Stone earlier this week that his performing was “not gonna happen for whatever reason,” Sorum might have the performance stage to himself (with the always ready-to-go Steven Adler). Drum solo! !